Thanks to my colleague Allen Taylor at LS3P ASSOCIATES LTD for sending out a link to a free online "Radius Around Point" tool where you can draw any size ring around any location on the globe. This site is good in that it lets you draw multiple points (perhaps helpful for manufacturers), but otherwise it's limited by the use of a small box, clunky navigation, and no save or print features. It also didn't work well in my browser (Google Chrome), so I thought I'd check to see if there any better options. I should point out that, though having nothing to do whatsoever with the LEED project you're working on, whoever put together the radius map also put together a bunch of other interesting modifications using google maps, including one heatmap showing the density of fast food restaurants in the US. Potentially practical, but not helpful in it's current form is a driving distance radius map, where from any point it will show the extents of a circle not as the crow flies but as a car drives (right now set only at 30 miles). With some tweaking this could end up helping with SSc4.1, Public Transportation Access documentation. I know google has a 'pedestrian directions' feature, and if I can get the developer to set this in 1/4 mile and 1/2 mile increments it could quickly support your documentation in that credit. If this happens I'll be sure to let you know. Any other magic map mathematic wizardry I may have missed? Please let us know by sharing a link in the comments! NOTE - 05.06.09 - Many thanks to the readers who provided links to a number of other 'circle' map websites. Just click on the link below that says something like "6 Comments" to see what else is out there. I have also created a basic map that draws a 500 mile circle. I am looking to add some features to it, so I will look into some of the suggestions you have made. "Unfortunately it also does not have any embedded print or save tools"
A simple screen capture will get around this issue. For Windows users, simply hit the "print screen" key on the keyboard (above the insert, delete, page up/down keys). This copies whatever image is on the screen to the Windows clipboard, which you can then paste into a Photoshop image or other app for editing. I'm not sure how it's done with a Mac. I think the very best tool for the Regional Materials and Sustainable Sites credits is Google Earth. It seems to be designed for LEED documentation. You can easily and quickly determine: the distances between two points (ie your project and the place of manufacture/extraction) using the measure tool, search for the nearby ammenities for Community Connectivity/Alternative Transportation, and save satellite images to be marked up for the documentation. Thanks Google! 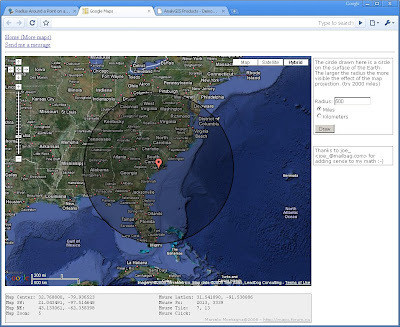 Another great site is "GPS Visualizer: Great Circle Distance Maps." Scroll down to the bottom for the range rings feature. It works really well with Google Earth and Google Maps, which allow you to save your radii. It is great for documenting development density too. This site is helpful too. You input your zip code and the manufacturers zip code and it tells you the mileage based on geographic location, not driving distance. I still use a paper map and a compass. Works fine for me. This site lists basic services (almost as defined by LEED v.3) for thousands of neighborhoods. Might come in handy for SSc2. I found a site through twitter http://www.mrgreenpoints.com that has a 500 mile circle tool and filters search results to show only products manufactured within 500 miles. mr greenpoints charges a fee to the user but i used the Eco Greensource search engine for free. I checked out Eco greensource. There is only about 100 items so far so pretty limited. Check out www.specnearhere.com. It has recently launched. 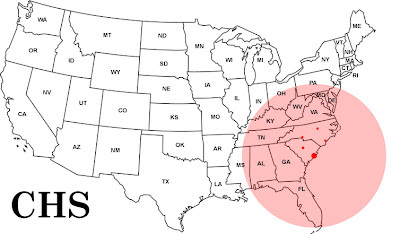 This tool allows the user to search for a specific building material they want to specify and a selected radius which results in a map identifying manufacturers located within that radius. We think it is a great tool and would welcome any comments. When trying to determine MRc5 you need more then just the address for the manufacturer, this could be their home office and not the location of the manufacturing facility. How does this help determine a 500 mile radius if it does not show both the manufacturing location and point of extraction? I have found the maps made by Erichsen-group.com perfect for completing my LEED application. It's Official: 100,000 LEED AP's Worldwide! Obama Passes LEED AP Exam!